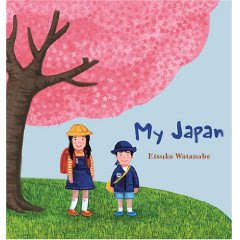 My Japan by Etsuko Watanabe. Kane/Miller. 2009. Copy supplied by publisher. The Plot: Yumi, seven years old, lives outside of Tokyo. She shares her life with the reader, from going to school to holidays. The Good: Yumi presents her life in a matter of fact way, full of the details that readers love. Even the back cover gives information (Japan has over 3,000 islands). Yumi's Japan is modern; when she shares the meals she eats, there is sushi, ramen, tonkatsu...and hamburger. And spaghetti. It is also traditional; during summer vacation at her grandparents, she wears a yukata. The illustrations are bright and full of things to be discovered, some of which are explained (the process of taking a bath, where one washes before going into the tub) and some aren't explained (the kitchen shows storage in the floor, something I learned about from reading Apartment blogs.) Other details, such as those about the school days, are ones I've read in Here and There Blog, a snapshot look at Japan written for kids. Kane/Miller publishes children's books from around the world. Guess where My Japan was first published? Wrong! France. All right. I've been meaning to review this for some time and never got up the gumption. You may have just inspired me to do so.